If you've ever seen the movie, Mostly Martha, you'll recall the scene when Martha, a German chef at a gourmet restaurant, sits alone at the end of the day in the quiet of her own kitchen, preparing to eat a piece of fish. With the help of the subtitles, we hear her contemplate how the talent of a chef is often judged by the quality of their simplest dishes; in this case, fish in a light basil sauce. It needs just the right amount of salt and pepper, she says. "No design. No exotic ingredients. Just the fish. And the sauce. The fish and the sauce." My husband teases me sometimes, saying I'm just like Martha, because my favorite way to eat salmon is simply broiled with salt and pepper. "Just the fish." His palate, on the other hand, is much more demanding and adventurous. When I asked him this weekend if he would be willing to eat sauteed spinach as a side dish for Sunday night's meal, he said "Yes, but only if it has more than salt and pepper on it." In other words, not just the spinach. My thoughts turned to the garden and I remembered that I have a good amount of mizuna ready for picking. 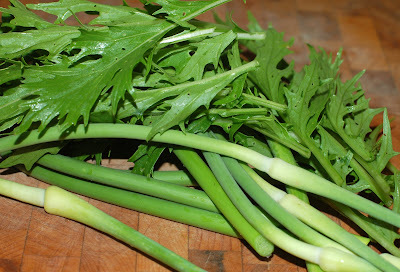 Mizuna has a delicate mustard flavor, and it can be eaten raw or cooked. Since we only had a small amount of spinach (store-bought, because mine in the garden is seriously ailing), I decided to supplement it with mizuna for a flavorful kick. 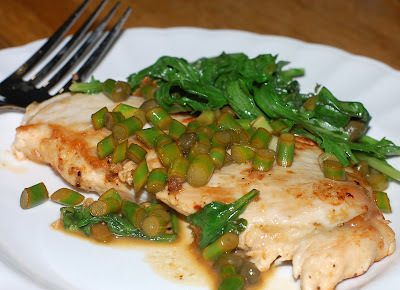 The mixture of greens made a simple but delectable side dish to our meal of Chicken with Garlic Scapes and Capers. After Michael downed a few forkfuls of the lightly sauteed leaves, he asked me, "Did you put mustard in this?" "No. No, I didn't put any mustard in there," I said. "It's just the mizuna." I am going to have to try mizuna! I have arugula but no mizuna! Now I am hundry! Okay, that would be hungry! 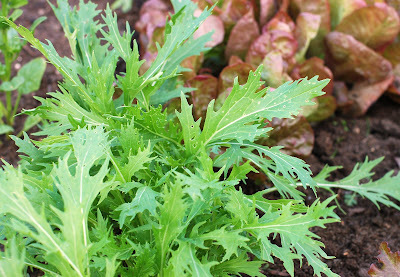 I think I'd like some mizuna in my garden! I like all kinds of different greens, rocket and mache being my favorite at the moment. Where do I buy Mizuna? Where do I get seeds to plant for my garden and is it a cool weather plant?